As I make my way through the fantasy genre, I find some critique fascinating. How realistic do we need to make our fictional, made-up worlds? How far can we stretch a reader’s belief until they don’t buy what we’re presenting anymore? For me, I stop believing when I don’t think the actions being taken by the characters are consistent with the personalities the writer has developed for them. Or if the writer establishes a set of rules for their magic, then breaks the rules because it’s convenient for the story line. Those kind of things drive me bonkers. What I’ve noticed lately is that there are MANY other things that drive some people crazy, especially when we’re talking about medieval fantasy. 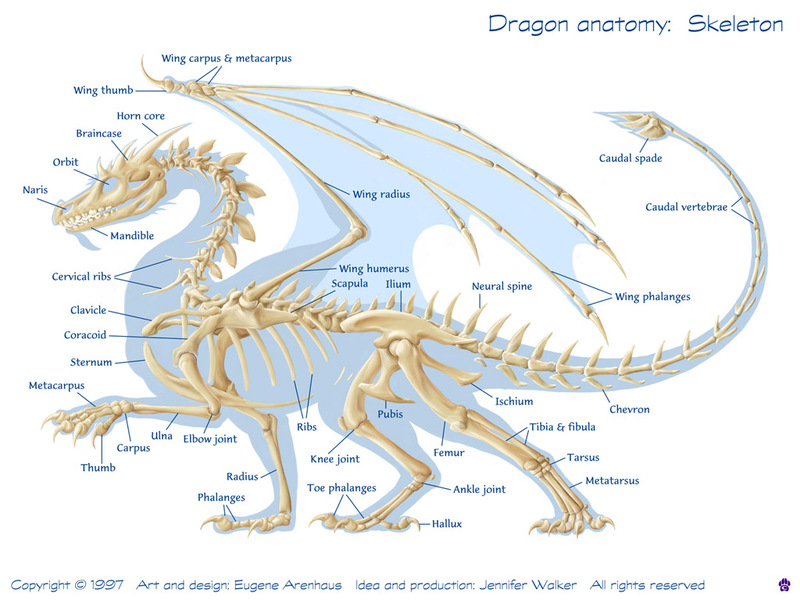 There is an entire website dedicated to the anatomy, behavior, and culture of dragons. It’s quite fascinating and I admit to studying the above diagram when I was writing about tacking a dragon to be ridden by a human. Dragons could not have evolved from Earth-like animals, not in the form commonly considered (see above). You have horses and dogs and cats and deer, all with four limbs. Dragons have six. Where would the extra set come from? It doesn’t help that we assume the front and back legs are hinged with the same pieces in the same way as familiar animals. Then, out of nowhere it seems, there’s a set of wings that spring from the back without the strong keel bone birds have to anchor them. What is going on? How can I possibly believe in this ridiculous creature? Fooey. Fooey, I say. (Actually, my mom says, but I thought it was appropriate here.) This is a FANTASY. It’s steeped in this thing called MAGIC. As long as the anatomy of the dragon doesn’t break the rules of the made-up world, who cares that the thing has an extra set of limbs. That’s what makes it FANTASY. In Tarbin’s True Heir, dragons and griffons and nadph (a treant derivative) are magical creatures which means their anatomy doesn’t make any sense to the mundane world. but they certainly add that mystique and wonder that is essential to a medieval fantasy. I understand that looks like a whoopee cushion for a giant, but the odd shape is actually one of the first cannon designs. In Medieval times, knights walked around with swords in full armor and that is that. Certain talented rogues might have daggers, while armies used battering rams. But that’s it. Gunpowder and its deadly uses didn’t come about until the Renaissance where Europe developed much more sophisticated ways to kill each other. BBBBZZZZZZZ! Wrong. As the above site elucidates with their educational timeline, Medieval Europe DID have gunpowder and cannons as well as handguns (that part surprised me). Though I’m not sure why it’s important when Europe started using gunpowder fueled artillery, because this is NOT Earth and it’s NOT nonfiction. As long as a rich, flowing history is developed, I’m not sure why it matters if Europe had whatever tech is presented in a fictional fantasy. I mean, Europe didn’t have MAGIC either. I’ve always been confused why epic fantasies don’t commonly use more advanced weaponry. In Tarbin’s True Heir, Prince Tanin Winterlaus is flabbergasted when the kingdom to the north has cannons on a ship. Tarbin hasn’t mounted any such artillery on a moving vessel yet, though cannons are an old stand by. I think I’m going to have to add handguns to the sequel. Powerful women of the Middle Ages in Europe. In Medieval times, women obeyed their fathers until they were married, then they obeyed their husbands. ALL women. You can’t have a female farm girl who is feisty or a queen who disobeys her king. Completely unbelievable. ALL women were meek and quiet and did as they were told. Seriously? Was there some sort of chemical shift in the brain of females that modern women can think for themselves and be spirited and intelligent and self-motivating when only a few hundred years ago women were but mindless obedience in pretty skirts? No one really believes this, do they? Of course, there were women who were independent thinkers and world changers. If you want some examples, read away. Was it harder for women than men to control their own destinies? Yes, MUCH harder. But wealthy, noble women had a better chance than the poorest of men. Were women expected to obey their male relatives? Yes, can’t be denied. Does that mean they always stuck by those traditions? Of course not. Men haven’t changed that much and neither have women. Now, society has morphed drastically. But individual people? Not so much. Plus, when I write or read a story, I want to explore the actions of the exceptions to the rules, not the characters who mind their place and do what’s expected of them. How boring is that? In Tarbin’s True Heir, Princess Talia Winterlaus is the first born royal twin and wishes nothing more than to serve her people as she feels is her birthright. When she’s given the opportunity to compete against her brother for the title of True Heir, she jumps into the quest without a second thought. What complaints have you heard that don’t resonate with you? Are there any deal breakers when you’re reading fantasy? Tarbin’s True Heir releases on September 30, 2017. It’s For Research. I Swear!